UPDATED: Wed., Jan. 9, 2013, 9:42 p.m.
Brandon Kaufman took his game to a higher level last season. Now he hopes to do the same in the NFL. After a record-breaking junior season, the Eastern Washington University wide receiver will forgo his senior year and make himself available for the NFL draft in April. Not that it was easy. Now that the doubts are removed, Kaufman will start training this week in Orlando, Fla., along with former teammate Greg Herd. Kaufman and Herd are represented by the Foster Easley Sports Management Group of Seattle. “I feel confident I can play at the next level,” Kaufman said. Meanwhile, quarterback Kyle Padron said Wednesday that will enter the draft as well. Kaufman and Padron are the second and third EWU players in the past three years to depart early for the pro ranks. Running back Taiwan Jones left after his junior season in 2010 and was a fourth-round draft choice by the Oakland Raiders. In addition to Kaufman, the Eagles also lose former All-Americans Herd and Nicholas Edwards, both of whom are seniors. The trio of Kaufman, Herd and Edwards combined for 139 games’ worth of experience at Eastern (103 starts), and had totaled 601 catches for 8,713 yards and 83 touchdowns. Other Eastern seniors who may attract professional interest include linebacker Zach Johnson – whose twin brother, Matt Johnson, was drafted in the fourth round by the Dallas Cowboys a year ago – and a trio of 2012 FCS All-Americans in offensive tackle Will Post, defensive end Jerry Ceja and kicker Jimmy Pavel. For Kaufman, the decision was based on various scouting services that forecast him being drafted in the middle rounds of the draft. Kaufman said much will depend on his times in the 40-yard dash. “That’s really the No. 1 thing right now,” Kaufman said. Kaufman finished his 42-game career with 221 catches (third in school history, seventh in Big Sky history) for 3,731 yards (second all-time at EWU, fourth in the Big Sky and 19th in FCS) and 33 touchdowns (second in school history). Kaufman broke the FCS record for single-season receiving yards in EWU’s 45-42 loss in the FCS playoffs to Sam Houston State on Dec. 15. He finished the season with 1,850 yards (93 receptions and 16 TDs) to break the record of 1,712 previously held by Eddie Conti of Delaware in 1998. Kaufman was quick to credit the Eastern coaching staff, especially receivers coach Junior Adams, for his development. “I’m ready for the pros because Coach Adams always treated us like pros,” Kaufman said. 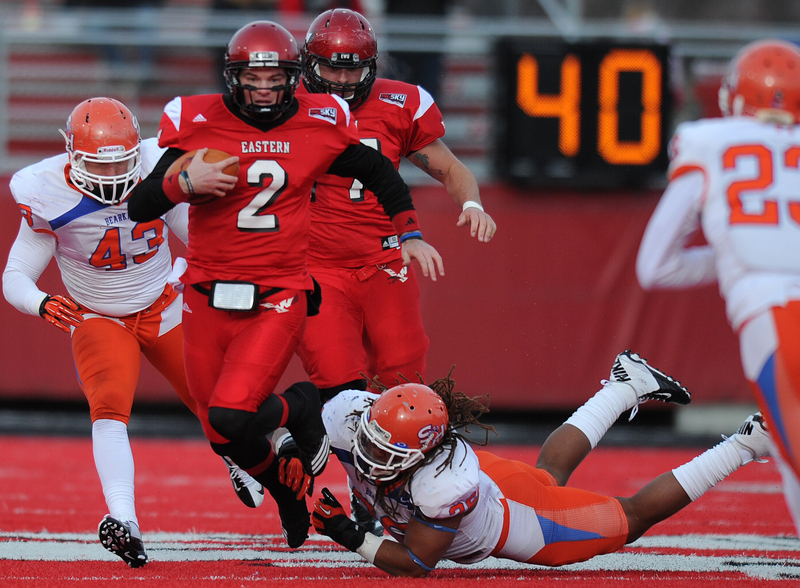 Kaufman is just 20 credits shy of graduating from EWU, and said he will continue to take classes this winter online. For Padron, the decision to leave early was all about timing. “It was something I’ve always wanted to do, and this was best year to do so,” said Padron, who said the decision involved his family back in Southlake, Texas. Padron said he met with Baldwin last week and discussed the possibility of turning pro. The 6-foot-3, 232-pound Padron played just one season with the Eagles after transferring from Southern Methodist. Padron completed 175 of 296 passes for 2,491 yards with 17 touchdowns and seven interceptions while sharing playing time with redshirt freshman Vernon Adams. “Whether I’m drafted or not, I just need to to get invited to a camp and try to show what I can do,” Padron said Wednesday afternoon from Frisco, Texas, where he is enrolled in the Beyond College Sports Network Pro Combine. Padron said he hopes his stock will be improved by exposure to offenses at SMU and Eastern Washington. Published: Jan. 9, 2013, 11:05 a.m. Updated: Jan. 9, 2013, 9:42 p.m.